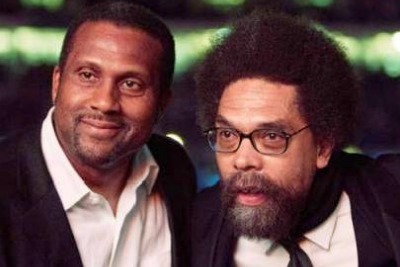 Tavis Smiley and Dr. Cornel west took time from their very busy 'Poverty Tour' to address the criticism they have been receiving from their community. They both went on to explain why they started the tour and why they both have been so vocally critical of the President. These rising rates of poverty, he said, is why he has been so critical of the president. A few days before the tour began Smiley went a bit further in his criticism of the president on his attentiveness to the poor, and particularly poor minorities. But Smiley said the bad vibes from the president's supporters has taken a toll. Y'all need to be ashamed of yourselves for making Tavis cry...LOL!!! Y'all just will not cut the brother some slack after all he's done for you negroes. This brother gave y'all the State of the Black Union and this is the thanks he gets. Bob Johnson don't look as crazy anymore for firing him from BET, huh? I'm just playing. I still have issues with Bob Johnson...LOL!!!! I think personal attacks are uncalled for. i will say that for Tavis, I never believed he had a personal gripe with the president and his accountability message in and of itself is fine. however, he has said it before that he expects the president to do some special for black people purely because we are his base and without us he would've been elected. I do not agree with that. Dr. West has said, among other thing, that the president is afraid of free black men...how is that not personal? Dr. West is very clever with words and can be very dismissive without people even knowing it. He wants a more activist/protest type of experience with the president. If my memory serves me correctly, their negative tone was set in the beginning and people are responding to comments that were made. It's great to be a voice for those impoverished but take that voice to the all elected officials. The president does not govern alone, so do not single him out and make it seem like he owes us. Phil Donahue interviewed Tavis on his radio show Friday. It was real interesting to hear his version of the time when he was catching the blues from Black people about Obama. In his version of what happened, we just jumped him because he wanted make sure Obama was accountable to him--us. The blacklash was too much for him. Smiley and West have raised some valid points. They have also been guilty of making it personal. I have heard statements that are at best the grumblings of their respective egos. So they both need to stop acting like it has not happened. We viewed the same interaction between West and Rev. Sharpton. In 2012, the stories that have been collected on the tour are going to aired on the show. This is the outcome of the tour. No true organizational agenda other than opposition in the making and it is not going to do what any of us expect politically or socially. It will be a good promo tool for listening to the programs, if you are into hearing the stories of broke and disgusted in America.